I love blogging. It has turned into a side hobby for me and it is exciting to really begin to see his blog grow! I have high hopes and goals for the future in growth… but even if I never reach those, I would continue to blog anyways. Why? It is the documentation of our life. I can look back and see picture and thoughts from different stages over the last couple of years. As I read others blogs, I often get a little sad… many have documentation of single years and documentation of the earliest years of their marriage. Those B.B. days (before babies). I really didn't start blogging until we lost our first child through a miscarriage. I think it was therapeutic, the writing, the sharing, the connecting. Then I just kept doing it. I started blogging last year, and I agree that it has been very therapeutic for me also! It out s such a great little! Even though I desire to encourage other women I find I am encouraged as I write and try to be real. It's also cool to see it as a documentation of our lives.my life is just so busy now that I don't get to blog as much as I'd like. Keep blogging!! I understand life getting busy too and not getting a chance to blog as much as you want. I think it is good to find balance… blog and enjoy, not to make sure you write a certain amount! 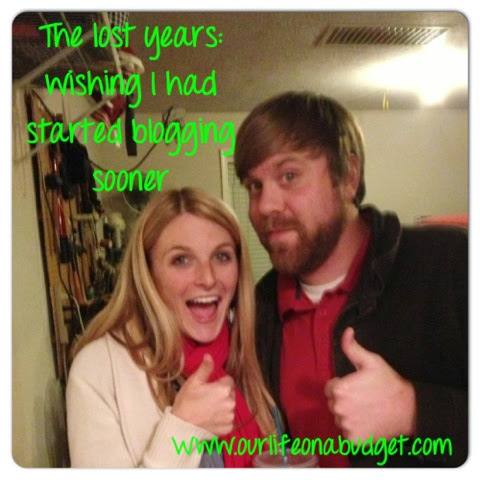 I agree - I started blogging over a year ago and then lost everything when I took a break. I deleted something that had all of my posts and photos attached to them and it was all gone. I seriously cried. NEVER AGAIN! haha. it's so much fun! I blogged several days back about 5 reasons you should start a blog! I think everyone could benefit from it! I read your post and it was so good (as usual :))… and I don't know what I would do if I lost all the stuff on this blog!!! Stopping by from Marriage Monday where you were my neighbor. I also love blogging. It's my writing outlet. I've met wonderful friends and learned many new skills. Hopefully I've passed just as many on to others. Blessings to you. I'm so sorry you lost your precious baby! We have a sweet little one in the arms of Jesus too! I never even HEARD of blogging until many years ago. I was googling something and clicked on a blog that had some info on it. From that I clicked on another blog. Pretty soon I was reading their frugal blogs nearly every day. It was actually a few months before I started my own blog. That's so funny... That's the same path our blog is taking too! Frugality... To a little but of everything! Stopping by from www.joyfromgrace.com. I am with you! I have a family blog to document our adoption in addition to my ministry blog, but I so wish I had those years before kids documented as well. Sometimes, my husband and I scratch our heads as we try to remember those years (maybe it is the lack of sleep!). Keep up the great blogging. I can't wait to follow your blog now! I love blogging. I think I do it more for myself than anyone else. I started blogging not long after our first child was born so our family could keep up to date with our life since we live in another country to them. Now I would say I just love it because it's my own special project. I'm sure my kids and husband will be thankful to look back years down the road and see what we were up to.